Clarendon City Hall is located at 270 Madison Street, Clarendon, AR 72029; phone: 870-747-5414. Photo: Jeffries-Crabtree House, ca. 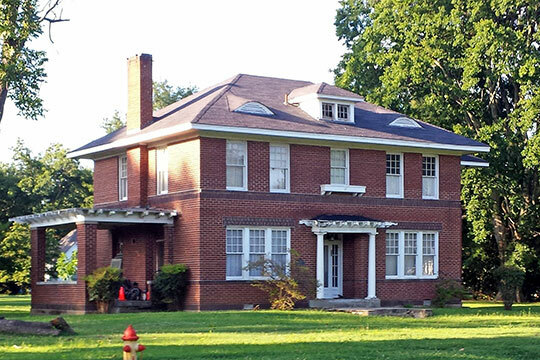 1923, 300 Jefferson Street, Clarendon, AR. Listed on the National Register of Historic Places in 1984. Photographed by User:Brandonrush (own work), 2014, [cc-by-4.0 (creativecommons.org/licenses/by-sa/4.0/deed.en)], via Wikimedia Commons, accessed August, 2015. Clarendon at the confluence of Cache and White Rivers, is an old river town which is still supported to a considerable extent by river products and traffic. In 1819 a post office was established here and called "Mouth of the Cache." By 1838 the settlement, then known as Roe Rock or Rockroe (to give only two of many spellings), became the eastern terminus of a stagecoach line from Little Rock; here travelers transferred to White River steamboats. Like other river ports, Clarendon has often seen floods. In 1927 the levee was under such terrific pressure that when it finally went out the water rose at the rate of a foot an hour, and the town was under 18 feet of water. Levees built in 1935-37 have greatly reduced the danger of future floods. Cat, drum, buffalo, and carp, locally called "rough fish," are taken in great quantities from the White River by fishermen equipped with trotlines and seines. Gasoline-powered boats collect the fish from "shanty boatmen" and bring them to Clarendon and other river towns for packing and shipment to cities in the East and North. About $2,500,000 worth of rough fish are caught in eastern Arkansas rivers and Jakes each year. Mussels, some of them pearl-bearing, also grow on the White River bottom, and are scooped out by diggers and sold to Clarendon's pearl button factories. The Pearl Ann Button Plant, on South Main St., is a typical industry of its type. About 30 workers are employed seasonally in cutting blanks from the shells. Most of the blanks are sent to Iowa for finishing, although some go to upstate New York. Present-day river traffic centers around the Choctaw Transportation Company Dock, just below the White River highway bridge. The company operates steel barges and light draft steamboats on the White, Mississippi, Yazoo, and Ohio Rivers. Two sawmills at Clarendon receive cargoes of logs regularly. The Monroe County Courthouse, a block from the levee, is a large two-story gray-brick structure whose red hipped roof is broken by dormer windows and drawn up into a peak at each corner. From the middle of the facade rises a tower twice as tall as the courthouse proper and visible for miles through the trees. The business district surrounds the courthouse and spreads down along the levee.